Thursday, March 14, 2019 at 2:27 p.m.
To highlight student scholarly endeavors within our school and celebrate research that is completed or underway. If you would like to be included in the School of Education Student Scholarship Exhibition, use the link below to complete an online application to present. Application forms are due by Thursday, April 11. A luncheon will be held on Monday, August 31, from 11 a.m. to 1 p.m. in McAllan Hall 123 to introduce new faculty members to the School of Education faculty, staff, and administrators. 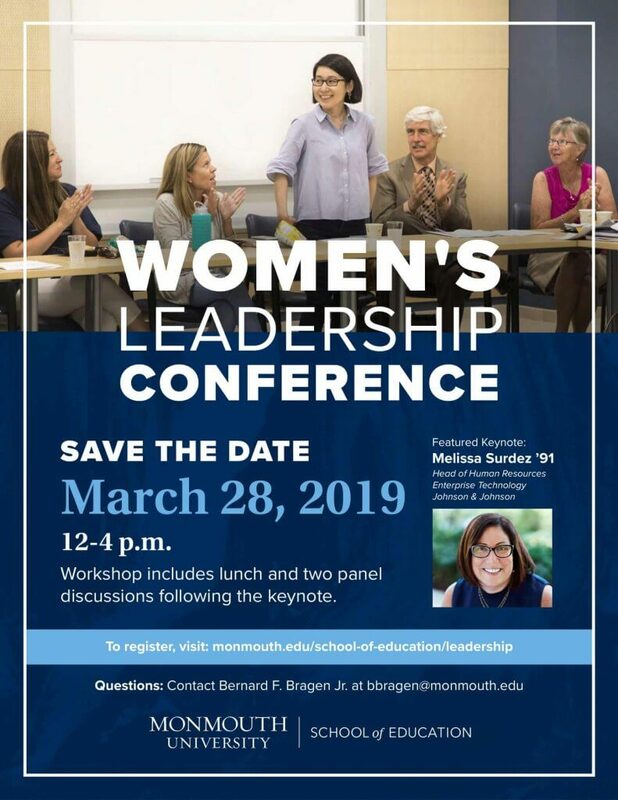 For more information, please contact Kathleen O’Donnell at 732-571-7518 or kodonnel@monmouth.edu. This event is an invitation only informative session for area superintendents to learn about the Consortium and meet the new School of Education Dean, Dr. John Henning. Back to School Dinner Party. Complimentary wine, beer, and raffles provided by CJCEE. For more information, call 732-263-5473 or send email to CJCEE@monmouth.edu. 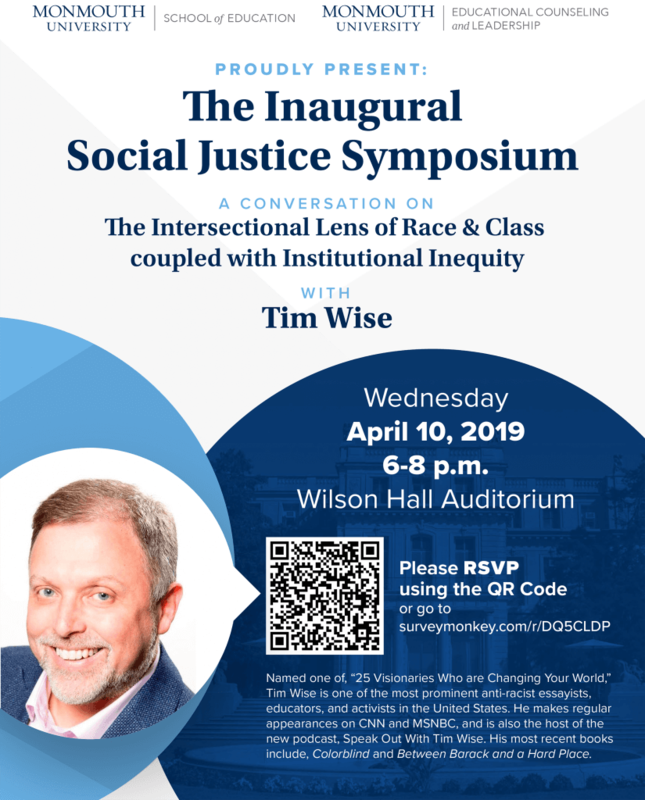 The Central Jersey Consortium for Excellence and Equity will present a membership-only workshop titled Beyond Diversity: Steps for Uprooting Racism, Privilege, and Institutional Inequity presented by renowned author, essayist, and educator, Tim Wise on Monday, September 21, from 9 a.m. to 3 p.m. in Magill Commons Club Rooms 107/108/109. During this interactive workshop, participants will explore the causes, both formal and informal, for institutional racial inequities. By examining the various policies, practices, and procedures that exist within educational, employment and organizational settings – and which often inadvertently perpetuate unequal opportunity and treatment – workshop attendees can develop strategies for shifting their institutional cultures in the direction of greater parity. Learn more about the Central Jersey Consortium for Excellence and Equity at Monmouth University’s School of Education. All students who are interested in Education are welcome to stop by McAllan Hall for dessert and meet the faculty. Music will be provided by Monmouth University’s own WCMX radio! Monmouth Lecture Series: Lori M. Gaines, Esq. Reception with light fare and refreshments starting at 6 p.m.
Federal special education law requires that school districts provide students with a “free appropriate public education.” But just what does that mean? In 1982 the Supreme Court considered this question in the landmark decision of Board of Education of the Hendrick Hudson Central School District v. Amy Rowley. Since then, however, the various federal court circuits across the country have adopted varying standards for determining whether a special education program is actually appropriate – some adopting the standard set out by the Supreme Court and others deciding to impose a greater standard. As a result, there is an inconsistency across our country and therefore an inconsistency in just how much educational benefit students with disabilities are entitled to receive based on where they live. This inconsistency led the Supreme Court to once again consider this question through the case of Endrew F. v. Douglas County School District. Join Ms. Gaines for an interactive conversation about the Endrew F. v. Douglas County School District case, the arguments made for and against imposing a greater obligation on school districts to provide more than the minimum educational benefit to students with disabilities, and the potential impact of the Supreme Court’s decision on the climate of special education across the United States.